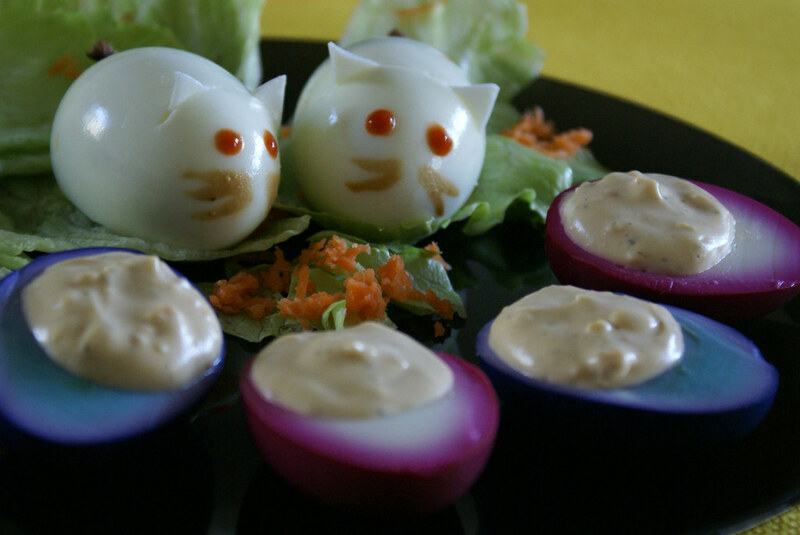 Pickled Deviled Eggs and "Egg Mice"!!! Hmmm… tough, it was for me, becoz I am not good with camera, and I was whiling away the time drooling over the lovely entries sent by my fellow bloggers here. 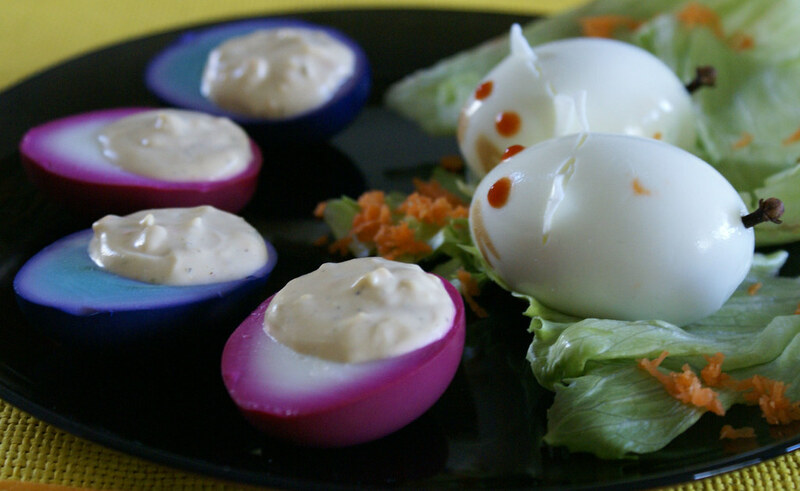 When I put on the thinking cap, many ideas flashed… and I decided to go with this – Pickled Deviled Eggs!!! Boil the Beets and Cabbage in separate vessels, with all the ingredients. Sieve them into 2 dry jars, and let them cool. Now add 2 eggs in each jar, cover and leave it in the fridge overnight. 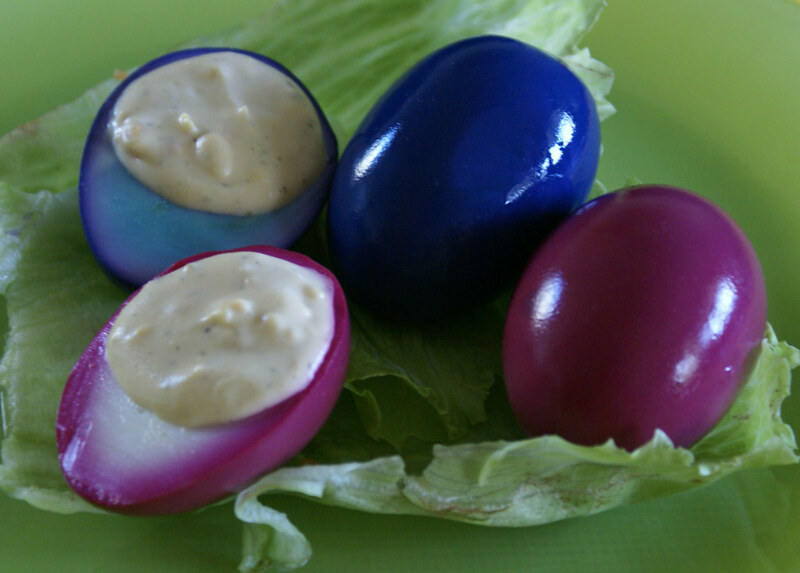 You get pink eggs (from beets) and blue eggs (from cabbage). Cut the eggs into half and scoop out the yolks. Mash the yolks with a fork or spoon, add Mayonnaise, Mustard, Pepper and salt and whisk till smooth. Fill the eggs with this and serve. Take a peeled hard boiled egg and cut off a thin slice from one side. Cut out 2 “V” shapes for “Ears” from that slice. Make a cut on the top to insert the ears. Draw the eyes with tomato ketchup and the whiskers with mustard and pierce a clove at the back for the tail. The platter looked so attractive and colorful. It is even ideal as a center piece on a dining table during dinners or parties. Kids will with no doubt enjoy these!! This is my entry for the CLICK event being hosted by dear Jai and Bee of Jugalbandi. Wow, beautiful colors Cinnamon! I didn’t know Red cabbage can turn eggs into such a bright blue!!! And the mice are sooo cute… very creative indeed! The natural dyes are jewel-like and gorgeous, and the mice are adorable! Wow! This really innovative Cinnamon and such pretty colours too. The mice look so cute. very pretyty. thanks for participting in CLICK!! Wow…total wow. How did you get such beautiful colors. So cabbage yielded blue , would never have thought of that. Very cool! Blue from cabbage? I had no idea!! I love your pickled eggs. Pink/red from beets but you got the blue color from cabbage??? Wow! I would never have thought of that! Very creative presentation with beautiful colors!!!!! Love the use of natural food coloring for the translucent look! Great entry!! BEAUTIFUL 🙂 Loved it, especially the mice 🙂 it did bring smiles on my face 🙂 I have tried natural dyes on eggs , during Easter time, but I didnt get such dark hue when I used beets…. Beautiful colors and lovely entry. waaaw, very beautiful template with a theme of fall leaves. looks real nice. loved the cute looking mice too. very creative!! Those mice look so cute.and pickled eggs with natural dyes is so innovative!loved all the photos! this is so lovely!! now i am all the more reluctant to do something about my entry 🙁 dont have any great ideas yet..
looks really lovely! a beautiful entry!! And those mice are *cute*! wow such colourful eggs, they looks just beautiful…. You have me grinning from ear to ear 😀 I love your entry! amazing pictures! those mice are really cute. oh those egg mice are soo cute! That is so sooooooo creative!! I LOVE your entry! Your egg mice really look so cute…Beautiful picture! Waaaav…never knew one can get soo innovative with eggs.. Thank You All for lovely Comments… and I was thrilled to see everyone leaving nice notes!!! The process of dying eggs was very exciting.. and I am glad that all of you liked it!!! Thank You all once again!!! Awww, these are adorable! What a cute presentation for such an economical ingredient. Pictures are so cute and colourful. natural colours and mice are looking cute.Noce creative idea. Lovely lovely eggs!! 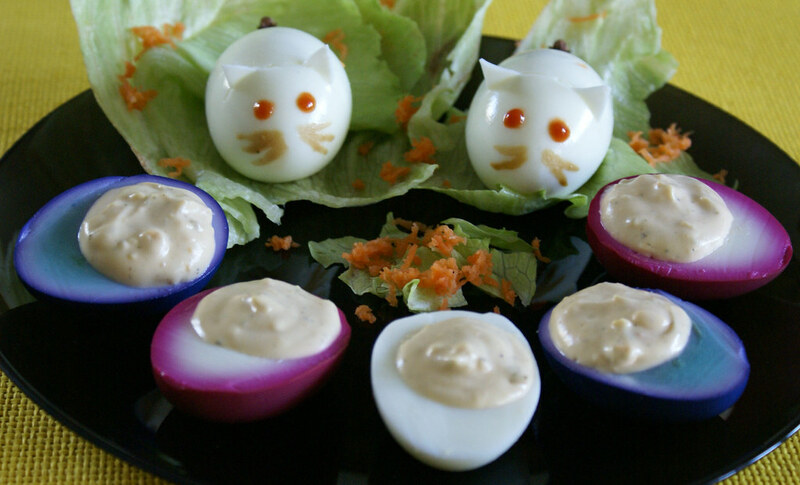 Sure is a fun way to eat those boiled eggs and I am sure kids love them too!! I wonder how I missed them! Wow..what a great site here, I’m sorry I haven’t found your blog before. These pictures are really talented and cute!